After WW1, childhood pals Tommy Beresford and "Tuppence" Prudence Cowley, lack money and prospects, become adventurers for the British Government. Rich American Julius P. Hersheimmer, powerful Mr Whittington, and an evil mastermind's conspiracy all seek Jane Finn, given papers vital to peace by an agent at the sinking of the Luisitania. Kidnaps, escapes. There is nothing better than an Agatha Christie book. I have not come across one of her masterpieces where I was either bored or felt like it was predictable. She just constantly puts me on the edge of my seat, making me second guess what's going on. The Secret Adversary is a complete different take on her mystery crime novels. Instead of joining her two elderly "detectives", Hercule Poirot or Miss Marple, we are introduced to two young individuals, Tommy and Tuppence. It was quite refreshing to read about to young sleuths solving a mystery not long after World War I.
Tommy and Tuppence (boy and girl respectably, if you weren't sure), both long time friends happen to meet up in London. They both admit they are hard up for cash with no job in sight. Their solution, well more like Tuppence's suggestion, was to become The Young Adventurers Ltd.
At first it wasn't actually to solve crime but to actually make it, but as luck has it, they were then thrust into a political battle to find important documents. I also loved that it was in the point of view of both our detectives. With a novel like this, I think it will be silly just to have it in the point of view of one character alone. It wouldn't make sense and we would be more confused than we were before. Plus, we want to experience both their adventures. If you have not read a Tommy and Tuppence novel, then what are you waiting for? 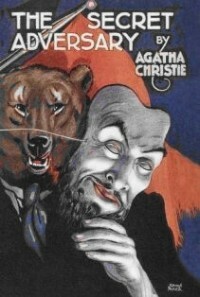 Actually pick up any Agatha Christie book, you will never be disappointed.